Dystopia Rising is a fully immersive larp set in a post-apocalyptic, zombie infested world. From Friday to Sunday you will live as a Survivor. You will eat, sleep, and fight in character. You will have to gather resources to survive, fend off hordes of the undead, stop raiders from attacking you in the night, and protect what little you have from thieves and killers who will hurt you to help their own chances of survival. How is it November already? How has Halloween come and gone? If it’s all too much to bear, do like we do and bury yourself in some games. We’ve got just what you need. The only thing better than playing games is playing games for a cause. 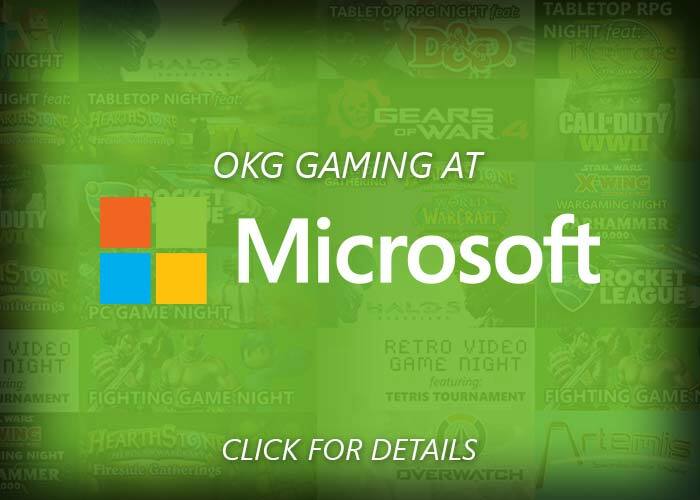 Oklahoma gamers are awesome about getting together to raise money for local charities. This Saturday is no exception. 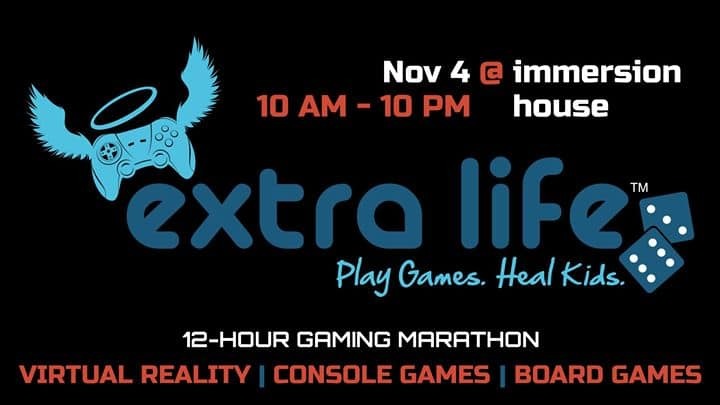 Join Immersion House and the Oklahoma Board Game Community for 12 hours of Extra Life gaming benefiting the Children’s Hospital Foundation. They’ll have virtual reality, console games, board games, raffle drawings and a visit from the Oklahoma City Blazers. Don’t miss it. Learn more. Do you have what it takes to survive the zombie apocalypse? Come say hello to the Dystopia Rising crew at Tokyo in Tulsa this July 14th – 16th and find out! Dystopia Rising is a Live Action Roleplaying Game based in a world where the undead have risen and claimed the world. Survivors band together in an effort to try and survive an irradiated wasteland full of zombies and inhuman raiders. Our crew will introduce you to the setting and provide you with the armor, contact safe weapons and skills that you will need to survive the wastes. Once you are geared up, you will get the opportunity to run through a short adventure and get a glimpse into the world that is Dystopia Rising. How you react to the world and the strange people and creatures that inhabit it is completely up to you. Save or betray. Profit or protect. It is all just a day in the life of a wasteland survivor. We hope you had a lovely 4th of July and are recovering from those sparkler burns and extra helpings of baked beans. Don’t get too relaxed though, there’s games to be played. Come warm yourself by the hearth and take part in the world’s most popular digital trading card game. New and seasoned Hearthstone players are welcome to come play while enjoying refreshments and possibly winning some prizes. You’ll need to bring your own device and can earn an exclusive card back just for participating. Learn more. If you love video games, Heartland Gaming Expo is for you. This hands-on experience features great industry speakers, tutorials, and over one hundred games produced by up-and-coming game developers. If you are a developer or want to become one, the expo hosts the largest game development competition in the region. We have multiple age and competition categories for elementary, middle and high school, college/university, and indie game makers. For those interested in learning to create games, the expo provides tutorials taught by leading industry experts. And for the truly courageous game builders, there is a 168-hour code jam. 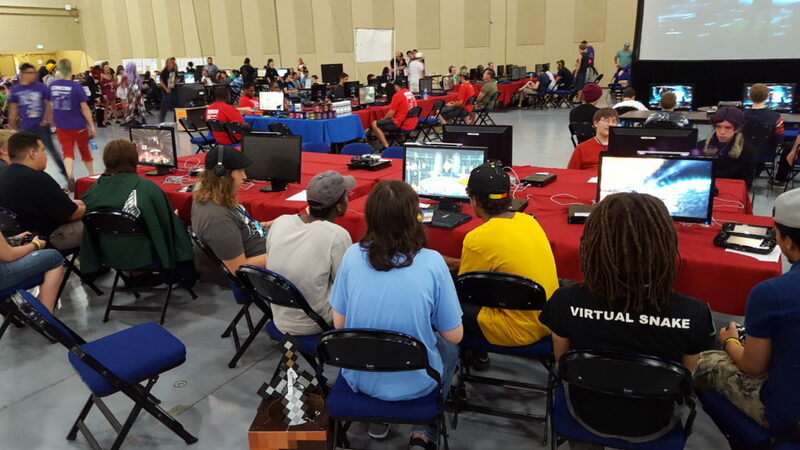 So if you build games, want to learn to build games, or just want to play games, bring your family to the largest spring gaming event in the central US: Heartland Gaming Expo. 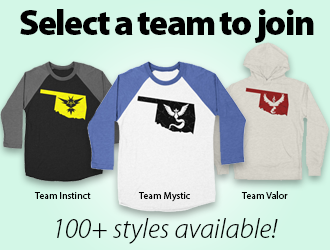 Check back for more details as the event approaches! Do you have what it takes to survive the zombie apocalypse? Join the Oklahoma chapter of Dystopia Rising and find out! Dystopia Rising is a live action roleplaying game based in a world where the undead have risen and claimed the world. Groups of survivors band together in an effort to try and survive the irradiated wasteland. You are one of these survivors. You get to create your own character, outfit and weapons. Your decisions can impact how the game plays out. Will you be the hero rushing off into the wilderness to save your friends, or will you sit in safety as you ignore the screams in the woods? Find out more about Dystopia Rising and the setting by visiting our website or joining us on Facebook. We have a free copy of our PDF rulebook available on the website. You can also find out more about the Dystopia Rising setting for Oklahoma and see what Strains are most common in the Sequoia Wastes. We use our Facebook group to organize local social events and share details about the upcoming game. We will host weapon, prop and costume building events to help you get ready for the zombie apocalypse. Ever feel like running away for the weekend to live in the zombie apocalypse? Well, Dystopia Rising has you covered. We are a weekend long immersive Live Action Roleplaying event set in a post-apocalyptic zombie infested world. Players create their own unique survivors that will have various skills that will be needed to survive. If you are interested in learning more about us, please join us at the Dennis R. Neill Equality Center this Saturday 3pm to 7pm. Come join ST Matt and more of the Dystopia Rising Oklahoma crew in Sulphur, Oklahoma and we can all work together towards creating the post-apocalyptic outfits, props and weapons of your dreams. This event will be held at 329 W Muskogee Ave in Sulphur, Oklahoma 73086.